The ROBIN project worked towards better climate change mitigation and biodiversity protection in Latin America. 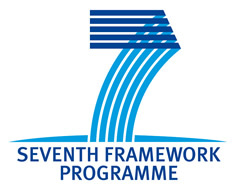 It is an EU Seventh Framework Programme project, coordinated by CEH and running from November 2011 - October 2015. This page provides a short overview of the project. Tropical forests provide us with foods, fibres and medicines. They filter water and control its flow. They also 'soak up' carbon dioxide from the air, mitigating climate change. The REDD+ programme (Reducing Emissions from Deforestation and forest Degradation) seeks to encourage sustainable forest management, thus maintaining ecosystem services, increasing resilience to climate change and conserving forest carbon stocks. To optimise carbon and non-carbon ecosystem services from tropical forests in the face of global change we must improve our understanding of the relationships between biodiversity and the socio-ecological processes through which we respond and adapt to change. ROBIN aimed to provide information for policy, together with resource use options, under scenarios of socio-economic and climate change. Quantify the role of biodiversity in terrestrial ecosystems in South and Mesoamerica in mitigating climate change. Quantify local and regional interactions between biodiversity, land use and climate change mitigation potential and the delivery of other key ecosystem services. Evaluate the socio-ecological consequences of changes in biodiversity and ecosystem services under climate change. Evaluate the effects of current climate change mitigation policies and actions on ecological and socio-economic conditions. Analyse the impacts of alternative land-use scenarios (and other mitigation options) aimed at maximising climate mitigation potential while minimising loss of biodiversity and ecosystem services and avoiding undesirable ecological and socio-economic effects. Provide guidance on land-use planning and other climate change mitigation options such as low carbon strategies and bio-fuel production. Improved understanding of the role of biodiversity in climate change mitigation. Strategies and tools for climate change mitigation. Assessments of the risks and uncertainties associated with climate change mitigation options. Quantify interactions between terrestrial biodiversity, land use and climate change mitigation (CCM) potential in tropical Latin America. Develop scenarios for CCM options by evaluating their effectiveness, unintended effects on other ecosystem services and their socio-ecological consequences. Combine new technologies (including remote sensing) for biodiversity assessments in complex multi-functional landscapes, data-based analyses, integrated modelling and participatory-driven approaches at local and regional scales. 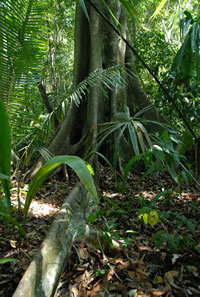 Tropical forests are a major store of terrestrial carbon. Reducing Emissions from Deforestation and Forest Degradation (REDD) is an effort to create a financial value for the carbon stored in forests, offering incentives for developing countries to reduce emissions from forested lands and invest in low-carbon paths to sustainable development. "REDD+" goes beyond deforestation and forest degradation, and includes the role of conservation, sustainable management of forests and enhancement of forest carbon stocks. ROBIN will help in the design and implementation of REDD+/++ schemes to ensure increased storage of carbon in forests and multi-functional landscapes and decreased rates of biodiversity loss. ROBIN will address this across a gradient from near-pristine forests to deforested land. 1. Comisión Nacional para el Conocimiento y Uso de la Biodiversidad (MX). 2. Empresa Brasileira de Pesquisa Agropecuaria (BR). 3. Instituto Boliviano de Investigación Forestal Asociacion (BO). 4. Instituto de Ecología (MX). 5. Universidad Nacional Autonoma de Mexico (MX). 6. Guyana Forestry Commission (GY). 7. NERC Centre for Ecology & Hydrology (UK) - Coordinator. 8. Alterra (NL). 9. Wageningen University (NL). 10. University of Klagenfurt (AT). 11. Potsdam Institute for Climate Change (DE). 12. University of Madrid (ES). 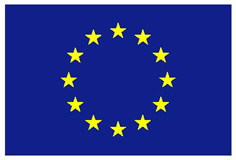 ROBIN was funded by the European Union's Seventh Framework Programme (THEME ENV.2011.2.1.4-1 - Potential of biodiversity and ecosystems for the mitigation of climate change).